Summary: Mysteries of the Worm is a collection of early Robert Bloch stories, several of which had not seen print in over four decades, based on the Cthulhu Mythos cosmology created by H. P. Lovecraft. As a teenaged burgeoning author, Bloch attained a place in the lofty Lovecraft Circle in the two or three years before HPL's untimely death, and his early writing was heavily influenced by Lovecraft. The earliest of these stories dates back to 1937, and it is rather easy to see Bloch's transition as a writer as one journeys from one story to the next. Early pieces such as The Secret in the Tomb are highly derivative of Lovecraft in terms of mood, setting, language, and flourishing style. The Mannikin bears the influence of Lovecraft's The Dunwich Horror and The Thing on the Doorstep. In time, Bloch began making his own contributions to the Mythos by exploring a newly-discovered avenue of HPL's geometrically twisted cosmos. In The Shambler From the Stars, Bloch introduces his own dark tome of mystic lore, Ludvig Prinn's De Vermis Mysteriis, or The Mysteries of the Worm, and it is this contribution to the Mythos that Bloch is most remembered for. The Shambler From the Stars is quite interesting because a character clearly based on Lovecraft comes to a nasty end similar to that of the mad Arab Abdul Alhazred himself. Dark Demon features yet another Lovecraft-based character, this one an author who comes to believe that his weird fiction is in fact truth he has been ordained to preach by Nyarlathotep himself. What I find most interesting about Bloch's stories, however, is the incorporation of Egyptian mythology into the Mythos. Inspired by Lovecraft's mention of Nephren-Ka in The Haunter of the Dark, Bloch takes us into the history of this evil pharaoh whose existence was supposedly all but expunged from Egyptian history. Nephren-Ka and his acolytes worshipped Nyarlathotep himself, and Bloch has ancient remnants of the group surviving under Cairo itself, while some of the worshippers along with a number of the priests of the god Bubastis escaped Egypt and settled eventually on the coasts of Britain, underneath the moors of Cornwall, where they continued their efforts to create a hybrid with the attributes of their deity. Bloch later looked back on many of these early tales with some embarrassment, pointing out the amateur quality many of them possessed. I, however, find all of these stories quite good and great fun to read. I would just point to one other story at this time as being of special interest. After Bloch killed "Lovecraft" in The Shambler From the Stars, HPL kindly reciprocated by killing a Bloch-based character in his classic tale The Haunter of the Dark. 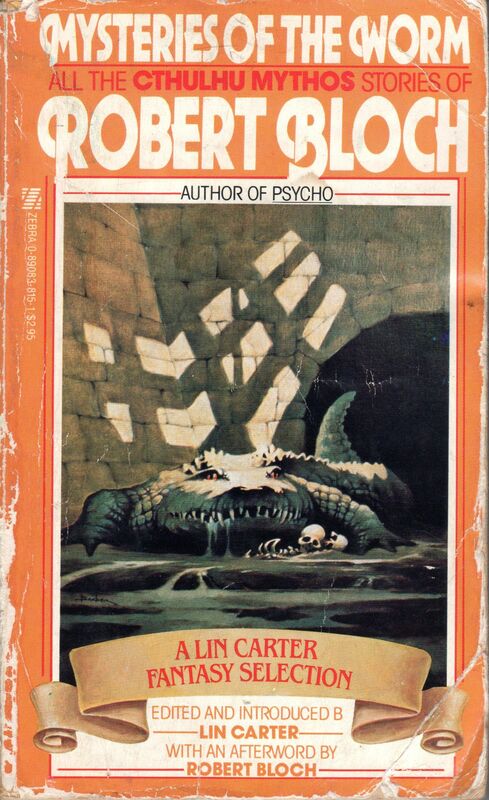 That happens to be one of my favorite HPL stories, so I was quite happy to find that Bloch had actually written a sequel to it in the form of The Shadow From the Steeple. While it lacks the stultifying menace of HPL's master work, it proved quite interesting and nostalgic to take up the events surrounding that old church steeple and the Shining Trapezohedron found there, the frightful jewel that served as a gateway through which Nyarlathotep, the Haunter of the Dark, could manifest himself on Earth. Featuring an introduction by Call of Cthulhu series editor Robert M. Price, an afterword by Robert Bloch himself, an essay by Lin Carter on Bloch's contribution to the Mythos, and a very helpful introduction to each story contained herein, Mysteries of the Worm is a book that all Cthulhu Mythos acolytes should own. While the stories aren't as complex and nourishing as HPL's own fictional creations, they not only satisfy the eternal desire for good Mythos-based weird fiction, they open up new avenues of the whole cosmology that are fascinating in and of themselves.